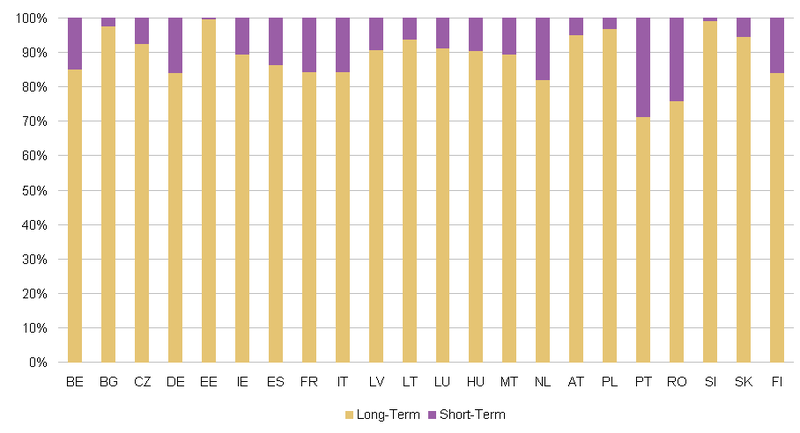 Banks Dominate Euro Area Lending because of the Low Ratio of Short Maturity Government Debt? I've seen this difference referred to on occasion over the years, but I've never seen anyone attempt to ask or answer, "why the difference?" 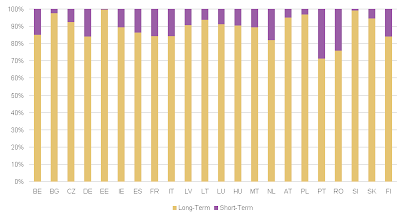 Based on the charts above, the Euro Area countries seemed to average roughly 10% short duration debt (maturing within one year) and 90% long duration debt in 2009. The US government on the other hand has issued short duration debt much more heavily -- ranging from around 30% to around 45% of total treasury debt outstanding in the years leading up to 2009. (Unfortunately I couldn't find charts with dates or date ranges that exactly matched between the US and Euro Area). As I explained in earlier posts on money supply endogeneity, banks seem to operate as a "lender of last resort" within the private sector. If there is a temporary "excess" of people who hold short duration assets (such as bank deposits -- i.e., money -- and short duration government debt which acts a lot like "money"), then these people will be more eager to lend (aka "invest", likely through an intermediary), thus transforming those short duration assets into long duration assets (debt assets). However, without that temporary "excess" of short duration assets, banks can always step in as the "lender of last resort", since bank loans create money. Thus any temporary "shortage" of desired short duration assets within aggregated private sector portfolios will disappear as the bank loans increase the money supply! These mechanics are covered in more detail at the previous posts linked to in the first paragraph. (You can use this visualizer to compare bank lending, bond issuance, etc). Bottom line: the private sector has to accept the maturity profile of the assets supplied to it by government (government debt satisfies savings desires), and builds upon that "starting point" to get to an aggregate desired portfolio maturity profile. In the Euro Area, it appears that this starting point includes "not enough" short duration assets, so to satisfy borrowing needs (note: borrowing needs are an independent dynamic from portfolio preferences), the private sector relies heavily on bank loans. But in the US, the "starting point" given by government already includes a larger proportion of short duration assets, so borrowing needs are filled using a larger ratio of non-bank lending, since non-bank lending changes the portfolio mix in a way that doesn't increase the percentage of short duration assets outstanding. And as I've suggested before, if the US government embarked on a truly massive shock and awe style QE (many trillions of dollars of additional asset purchases) as proposed by Paul Krugman and perhaps others, it might inadvertently "kill" a lot of the US banking system, or at least kill off much of banking's traditional on-balance-sheet lending function. (Banks might still earn fees from originating loans before selling them to non-banks, and non-banks could also originate lending as they do now). And along similar lines, when MMTers sometimes suggest that the US government should not issue bonds at all, I wonder whether they are aware of the possible impacts on the banking system. Just to be clear, I'm not expressing an opinion on whether such a change would be good or bad, I am just pointing out that the system might be different in large and unpredicted ways. 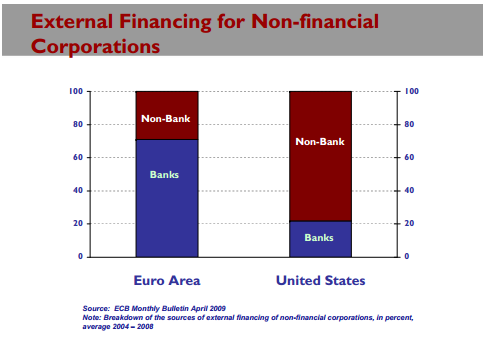 * DISCLAIMER: The first chart only shows "External Financing for Non-Financial Corporations," so a chart that also included household borrowing might tell a very different story that could contradict the analysis in this post. It seems improbable to me that there is a massive reliance by European households on non-bank lending that would be large enough to offset the corporate reliance on bank lending, but I'd be glad to hear if I'm wrong. 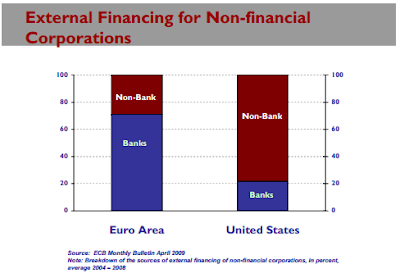 First, I realize I failed to discuss how the propensity of US households toward bank borrowing versus non-bank borrowing (of unknown amount) could change the premise I introduced with the first chart by making the Euro Area and US look more alike when considering the entire private sector's borrowing rather than just corporate borrowing. Second, the title read as more definitive than I originally intended, so I added a question mark -- this blog post's content (statements often prefixed by "I believe...") is still largely speculative, though there seems to be supporting evidence in the Circuitist literature (as I interpret it). People who would like to learn more about the nuts and bolts of how the economy works and some of the things wrong with conventional wisdom, but don't have the time or patience for the econoblogosphere, academic papers, or textbooks. Newcomers to MMT interested in a "quick start" overview before delving deeper into the core MMT material available at Mosler Economics, Billy Blog, Economics Perspective from Kansas City, etc. The feedback a few months ago when I put the first draft online was positive and responses suggested the material worthy of recommending to others. (And I have been attempting improvements ever since, though the core set of topics/pages covered has not changed, so you probably won't see much that's new if you've already gone through it). So lest it just gather dust, please consider passing the link on to interested friends / family / etc if you believe doing so could be beneficial. I hope at least a few will use the variety of available mechanisms to give feedback on which parts are easy to understand and which parts still need more clarity... and optimizing the content as I get feedback will be an ongoing project for me. Some people requested more breadth and depth of content. I still hope to cover many more topics (an aspirational roadmap is here) using current and new visualization mechanisms, but given the time involved in producing multimedia content like this, I don’t want to get too far ahead of having an audience for the content. The good news is with the content platform improving by the month as I tweak it, future content will be less time consuming to create. Of course I know I have to do some work to promote this content too, and do have a few ideas on where to start. But I’d be glad to hear suggestions.